When it came to the 1998 Tony Awards, the two musicals slugged it out. “Ragtime” lost to “The Lion King” for Best Musical despite winning Tonys for its book, and score, but did cop the Drama Desk Award for Best Musical. 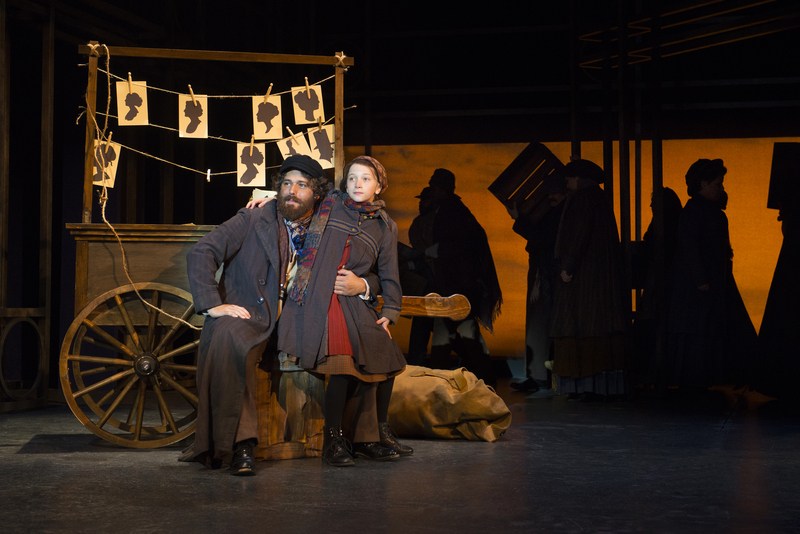 The production of “Ragtime” now at the Ogunquit Playhouse is artfully conceived and executed, at once powerful and poignant , and the company of 29 does full justice to the sweep and majesty of the musical. Composer Stephen Flaherty and lyricist Lynn Ahrens have woven the theme of social justice into many of their works, and this score – one of the two or three best theatrical scores of the last quarter-century – melds distinctive melodies and rhythms, soaring ballads and even a few novelty tunes. Flaherty and Ahrens employ gospel, cakewalk, marches and always, lingering close to the surface and recurring often, is the rag , a musical genre popular in the early 20th Century and distinguished by its syncopated or “ragged” rhythm. 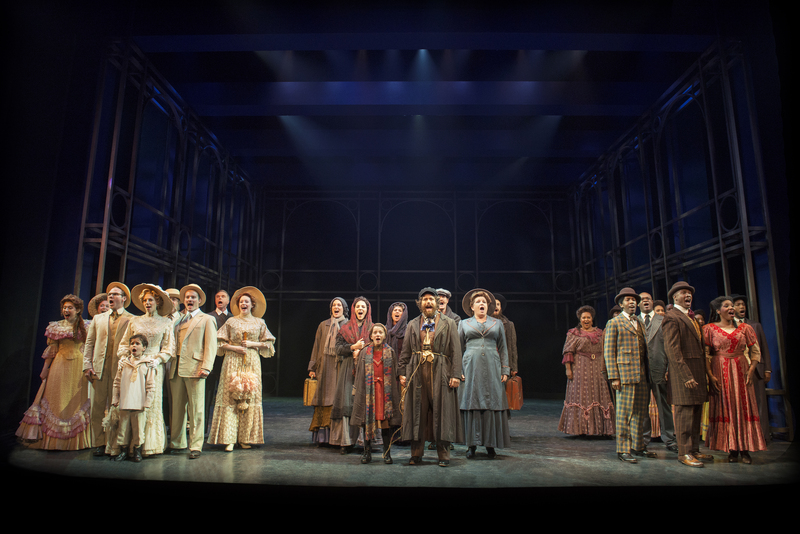 “Ragtime” has one of the more intriguing and effective opening scenes in musical theater history, as three groups of people whose stories and lives will be woven together circle the stage. There’s a well-off WASPish white family living in suburban New Rochelle, N.Y.; a group of blacks from Harlem; and a group of raggedy immigrants seeking a new life in America. They nervously circle each other on stage under Jesse Robb’s choreography before coming together in the final bars of the opening number. In lily-white New Rochelle, N.Y., Father (Jamie LaVerdiere) is a successful businessman and an amateur explorer who is off to the North Pole on a year-long journey, leaving Mother (Kirsten Scott) home with her young son (Tyler Wladis), her Younger Brother (Julian Decker) and Grandfather (David Stuidwell). As Father is leaving, the Eastern European immigrant Tateh (Josh Young),a widower with young daughter in tow, is arriving on a “rag ship” full of other poor immigrants. Tateh is one of the show’s linchpin roles and Young is perfectly cast as the immigrant who rises from abject poverty to achieve the American Dream. His Tateh is soulful, his hopes alive despite his despair , his dreams unbroken even as his poverty threatens to crush him. Decker’s Younger Brother is trying to find his place in life and ultimately rejects his brother-in-law and the family’s bourgeoisie lifestyle. Lindsay Roberts, an IRNE nominee for last season’s “Show Boat” at the Fiddlehead Theatre Company gives the part of Sarah full voice; Sarah is in despair after early on abandoning her child only to later embrace a future with Coalhouse and her child, a future doomed by hatred. doesn’t have the strongest voice I’ve seen play the part, but her lovely duet with Young in “Our Children” is a musical highlight. I am often arguing for actors to dial down the ethnicity of a part, but this time I’m going in the opposite direction. Klea Blachurst actually could stand to be more ethnic in her portrayal of Emma Goldman, the Russian Jew whose outspoken anarchist views struck a chord but led to her being deported. Lest the more serious themes – immigration\ and racism, to name just two – at the heart of the musical overwhelm the piece, Doctorow’s novel and McNally’s adaptation have interspersed those themes with some pop culture tidbits to lighten the tone. So there’s Carly Hueston Amborn as a vivacious and coquettish Evelyn Nesbitt, the femme fatale at the center of the so-called “Crime of the Century,” the shooting of famed architect Stanford White (Sam Hartley) by jealous husband Harry Thaw. Freddie Kimmel has some has fun as Harry Houdini , another immigrant who found his piece of the American Dream, industrial tycoons such as Henry Ford (Jack Doyle) are portrayed and there’s a a funny number about baseball. McNally’s book manages to tie it all together for the most part and Director Seth Sklar-Heyn has to be a bit of a ringmaster to keep the disparate plot lines flowing together towards their inevitable intersection. “The Lion King” is a fine show, but after seeing both musicals several times, history will give Ragtime the Tony it should have gotten in 1998. And this production at Ogunquit is just another good example of why it should have won. The Ogunquit Playhouse production of “Ragtime.” Music and lyrics by Stephen Flaherty and Lynn Ahrens. Book by Terrence McNally, based on the novel by E,L. Doctorow. Directed by Seth Sklar-Heyn. Choreography by Jesse Robb. Set design by Tim Mackabee. Music direction by Jeffrey Campos. At the Ogunquit Playhouse through Aug. 26. ogunquitplayhouse.org. Josh Young as Tateh and Ella Luke-Tedeschi as The Young Girl in “Ragtime.” Photo by Gary Ng.